Zimbabwe consumed almost 480 million more litres of petrol and diesel in six months between June and November last year than in the same period in 2017, a gargantuan 77 percent extra, at an additional foreign currency cost of more than US$200 million, The Herald reported. It is not known as of now who used the extra fuel and for what. Figures released by the Ministry of Energy and Power Development show that consumption of diesel and petrol in the first five months of last year roughly tracked consumption in the same period a year earlier. There was an anomaly with petrol, with March 2018 consumption more than twice the March 2017 level, but that was partly compensated by the January 2018 level which was more than 40 percent below the January 2017 level. But between June and November consumption rose exponentially each month with diesel peaking in October at 109 percent of the October 2017 level and petrol in September hitting 126 percent of the 2017 level. Consumption then started dropping sharply and by November both fuels were around 38 percent above 2017 levels. Diesel consumption was 71 percent higher in the six months, June to November overall, while petrol was 86 percent. Generally, fuel consumption in an economy, especially over a short period like a year, should mirror economic growth. An increase in the GDP of 5 percent should be matched by an increase in fuel consumption of 5 percent, economists say. Other factors can make the growth in fuel use higher or lower than economic growth. If the growth is in sectors where fuel is a larger cost factor, fuel use growth will likely be higher than economic growth. The fact that the bulges on the graph were similar for diesel and petrol discounts explanations around more personal use or more people driving to work. A high percentage of diesel fuel is used by commercial entities than by private commuters. Thus one would expect a close correlation between diesel consumption and economic growth. Similar consumption bulges for diesel and petrol also remove ethanol percentages from the equation. The percentage of ethanol in petrol has varied, but the biggest ethanol shortage in 2018 was earlier in the year, when consumption more closely matched 2017 levels. And in any case the maximum percentage ever was 20 percent. A lot of Zimbabwe's growth between 2017 and 2018 was in agriculture, where there would be higher fuel consumption and higher transport use bringing the harvests to market. But the April and May consumption figures, the busiest harvest period, closely track the equivalent in 2017 and even the June figure is not that much higher. Logistics experts noted that the switch in the Zimbabwean economy from less imported consumer goods to more local production tends to push down average transport distances of truck runs because of reduced distances. The election last July would have had an effect, but not in the hundreds of millions of litres. The May figures for 2017 and 2018 are close, while the climb in June and July for diesel was below the peak consumption although petrol did have a spike in July. But analysts said an extra 130 million litres in July could not be explained by the election. This would imply that every man, woman and child in Zimbabwe each drove 100km on election business. The total extra consumption of 479 million litres in the six months of the bulge comes to around 12 000 loads of 40 000-litre tankers. But even the 12 000 loads would be 2 000 a month or close on 70 a day. At peak consumption there would be more than 100 extra tanker loads a day, seven days a week. 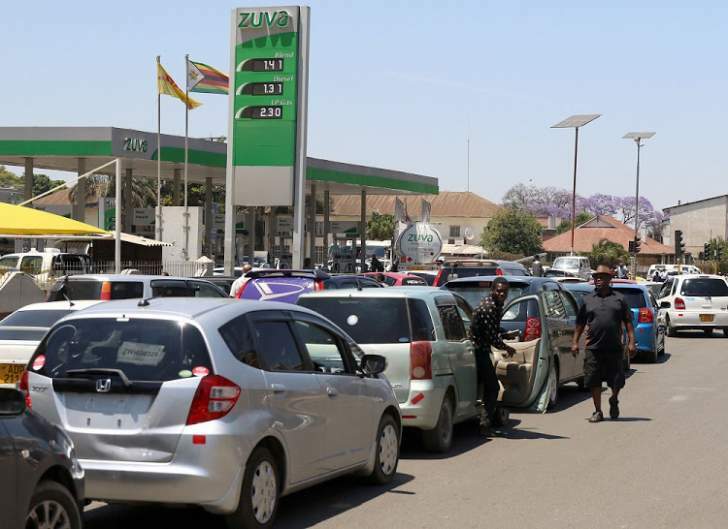 There were suggestions that Zimbabwean fuel was being smuggled over borders by dealers wanting to acquire foreign currency, in exchange for the transfer dollars they were using to buy the fuel in the first place, and to take advantage of arbitraging between regional fuel prices. But 100 full tankers a day crossing the border out of Zimbabwe would probably be noticed. There has been a number of new service stations in 2018, but that should not affect demand or sales, but simply redistribute market share. Economic growth driving fuel consumption can most of the new stations. On the other hand the black market can see a percentage of fuel sales looped through semi-criminal dealers but the same quantity reaches the end users. The monetary value of diesel and petrol during the five months, as recorded by ZimStats, shows the same bulges on the graphs, but less dramatic than the consumption bulges. This is because the cost of fuel was usually falling in the six months. Pump prices do not vary much since a large fraction of the pump price is made up of fixed costs: pipeline and haulage charges, taxes, levies and mark-ups for oil companies and service stations are all in cents per litre. The actual cost of the fuel as it arrives in Zimbabwe is a lot less than the pump price. But the bulge, much of it without obvious explanation, still chewed up more than $200 million more in the six months between June to November last year than the same period in 2017. Analysts noted a challenge however in that the Reserve Bank of Zimbabwe, which allocates all the foreign currency for fuel imports, either directly or through the oil companies, and the energy regulator, Zera, both only monitor use of the currency based on the paperwork generated. But neither they, nor ZimStats nor anyone else goes beyond monitor the total imported. For instance, service stations are rarely checked, and even then only when there is a specific complaint, and no one monitors fuel consumption once vehicles leave a service station. Thus no one knows who bought and used that extra 480 million litres in the six months and what it was used for.